On the last night of our time in Sydney we didn’t have any specific plans for dinner, but knew we needed to eat something. This was the most laid back day of our vacation, which turned out to be a good thing since this was the only rainy day we experienced during our trip as well. We wandered around the neighborhood and did a little shopping at a historic mall a few blocks from our hotel. Other than that, we spent time in the club lounge at our hotel enjoying the view and just relaxing. But, when it was time for dinner, we needed to decide what to do. We made the decision to keep dinner low key and walk across the street to a Westfield mall to check out their food court. We were delighted to find a Din Tai Fung Dumpling Bar! 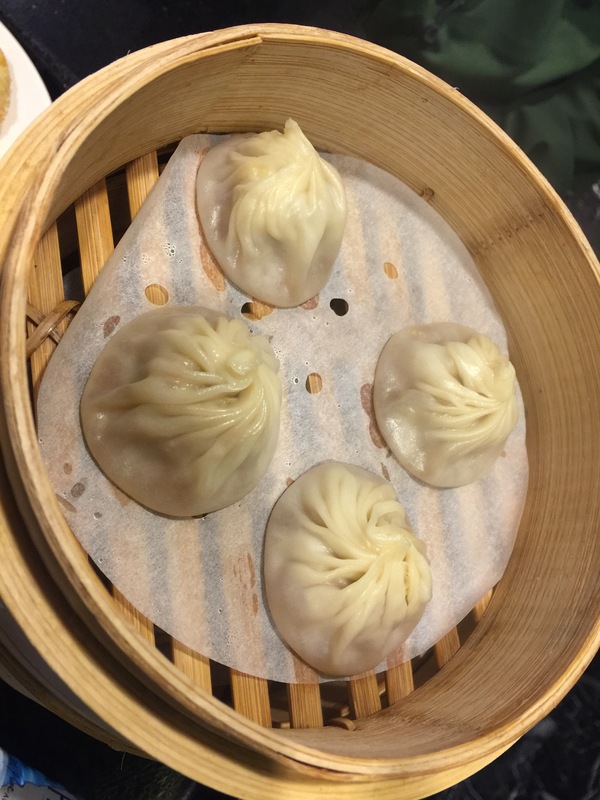 Almost 2 years ago, I wrote about our experience at Din Tai Fung Dumpling House in California and how much my husband and I absolutely fell in love with it. After all, how can you not love xiao long bao (soup dumplings). I guess, since Din Tai Fung is a well known Taiwanese chain, we shouldn’t be so surprised to find it in Australia. Heck, if they’ve expanded to the United States, why wouldn’t they be in Australia? What we loved was that this was an express dumpling bar, in a food court at a mall. The portions were smaller here than at the restaurant, but it was made quick and easy and in no time you were sitting down and enjoy the same food you could get at their restaurants. This was exactly what we were looking for to dine on this night. And just like the Din Tai Fung restaurants, they even had a glass window where you could stand and watch the cooks making the xia long bao right in front of your eyes! I was delighted to discover that even though this was essentially a fast food eatery, they still offered a few of the great Asian-flavored drinks we found at the restaurant. 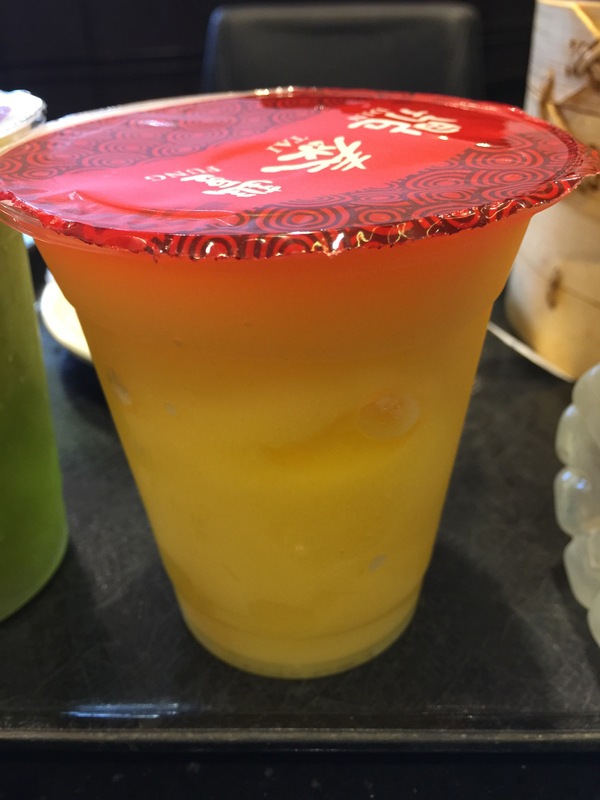 When we dined at Din Tai Fung Dumpling House, they offered a number of different smoothies and slushes, and here at the Dumpling Bar, I discovered they had a slush they called the Mango Tango. I can’t reasonably be expected to pass up a slushy drink made with mangos, could I? My favorite fruit in the world made into a slush, this was going to be good. Since this was a fast food establishment, the drink was served in a plastic cup with a sealed top so that you could take the drink to go, which was nice. The mango tango was nice and refreshing with a few chunks of actual fruit in the drink, which was a nice touch. It was sweet, but not too sweet, and the icy slushy goodness was terrific. My husband ordered the lychee mint freeze. Though admittedly, the drink was more mint than lychee, just look at the color of the drink. This was a sweetened mint slush with just a hint of lychee flavor. It was the lychee that adds the sweetness to the tangy mint drink. Luckily, my husband is a fan of mint-flavored things, so this was right up his alley. 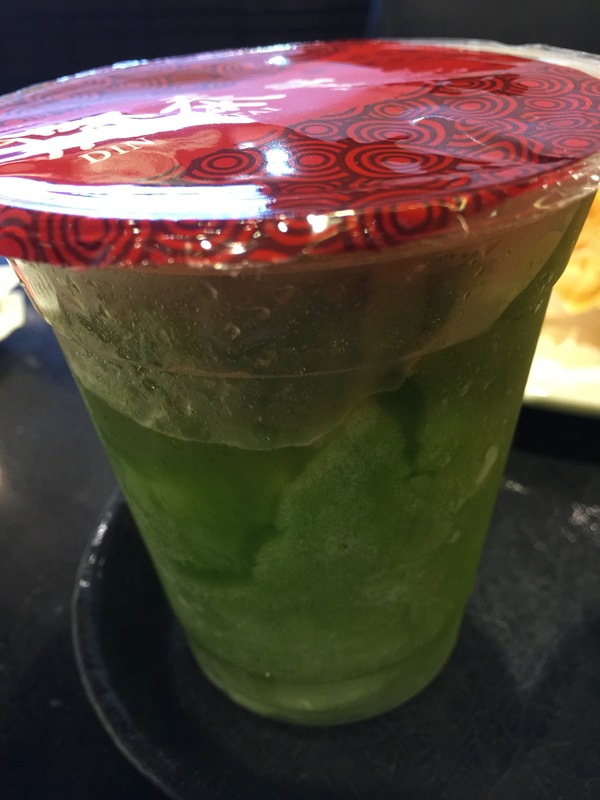 However, this lychee mint freeze also contained a whole lychee fruit at the bottom of the cup that was revealed once you drank the freeze itself. Kind of like a little surprise to finish off the drink. Since this was a dumpling bar and not the restaurant, the portions were a lot smaller than you’d expect at the restaurant, but that’s good, because it made it easier for the two of us to share a couple of dishes. 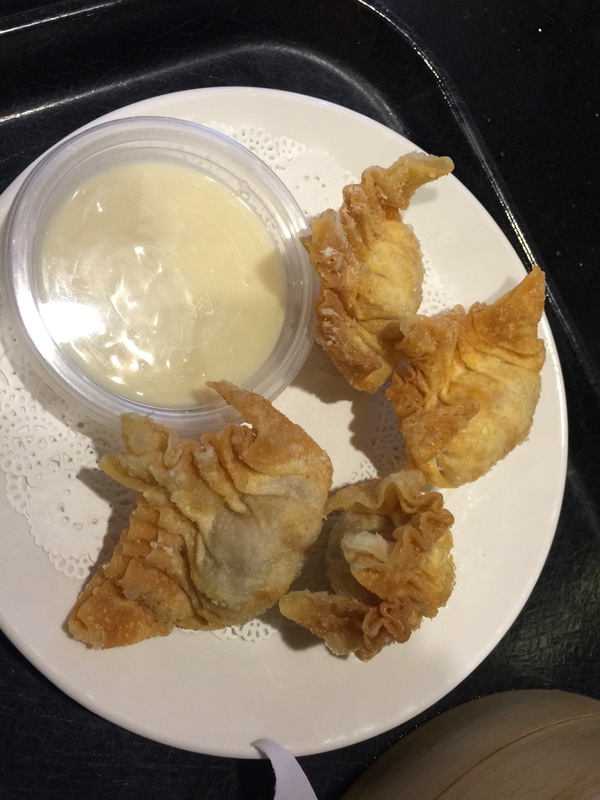 We started with some fried shrimp & pork wontons served with a dipping sauce. My husband and I aren’t big on sauces, so we never really discovered what the dipping sauce was as we never even opened up the package to taste test it. The fried shrimp & pork wontons were fantastic and absolutely stuffed with shrimp and pork. The wonton wrappers were thin and perfectly crunchy and crispy once it was deep fried. The stuffing was all meat with no fillers, a little savory and a little sweet from the shrimp. This was a great appetizer. But this was Din Tai Fung after all, and they are known for their xiao long bao, so we weren’t leaving without ordering some of the pork xiao long bao. Again, since these were smaller portions, each order of pork xiao long bao only came with 4 pieces, so to satisfy our craving for amazing soup dumplings, we ordered 3 orders, or a total of 12 pork xiao long bao. We figured that meant we would each get 6, and we could certainly finish 6 each. If I’m being honest, we probably could have ordered one more order and we would have been able to finish that as well. The pork xiao long bao are amazingly tasty and delicious. It’s still mind boggling how they make these amazing xiao long bao. Each dumpling is meant to be a one-bite wonder. The xiao long bao is served piping hot right off the steam basket. Pop a dumpling in your mouth and it just explodes as the pork broth is set free in your mouth. The dumpling dough itself is perfect as it isn’t too thick and doughy, but just thick enough to hold in the broth and provide a bit of body to the dumpling along with the ground pork that’s inside the dumpling. My husband and I just love the xiao long bao and can’t resist. For a something a little more substantial and filling to go with our meal, we decided to split and order of egg fried rice with black pepper beef. The egg fried rice was exactly how I like fried rice, made with rice, eggs and scallions. There is soy sauce flavoring, and nothing else. No peas and carrots or any other additives that take away from the fried rice. When I make fried rice at home, this is the kind of fried rice I enjoy. The black pepper beef was peppery and flavorful. Tender beef was sautéed with onions and green and red bell peppers. The sauce for the beef was amazingly peppery, with each bite providing a very peppery flavor. 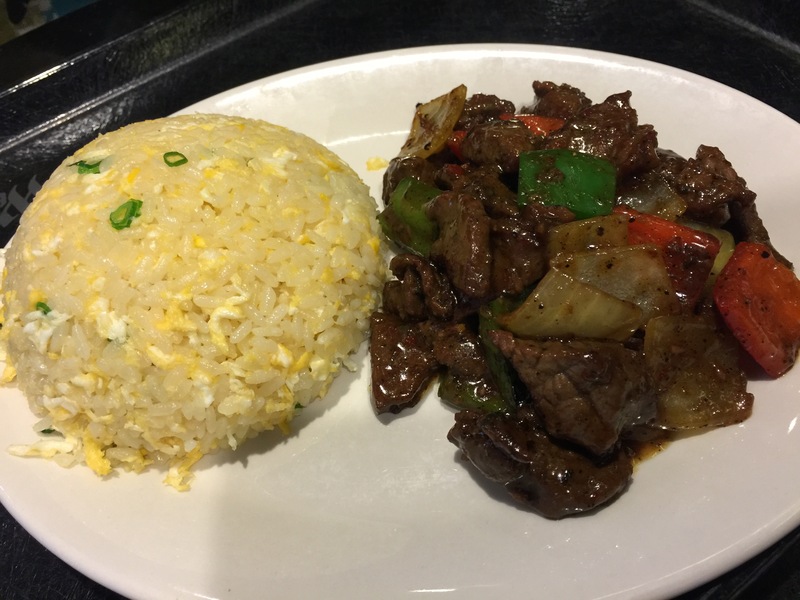 Together, the tender, juicy beef with the egg fried rice created the perfect combination. For me, it reminded me of home and the kinds of dishes my mom would make for me for dinner. These are the kinds of dishes I like and enjoy, and it’s comfort food. To find a little slice of home in Sydney was unexpected but very much appreciated. On the last night of our stay in Sydney, my husband and I wandered over to the mall across the street and decided to try to find dinner at the food court. We had no idea what we would find and didn’t know what we were looking for other than the fact that we needed to eat dinner. 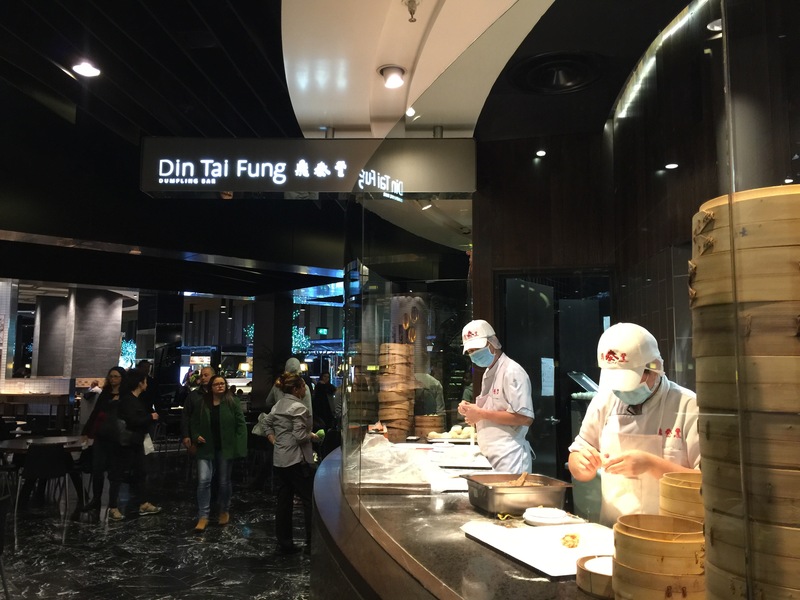 When we saw the Din Tai Fung Dumpling Bar, we knew we’d be eating dinner there. The food was as spectacular and superb as we remembered it to be. The pork xiao long bao was exquisite, and just like at the restaurants, you can see the cooks making the dumplings right in front of your eyes. The fried shrimp and pork wonton was a crunchy and crispy, delicious starter and the egg fried rice and black pepper beef was filling and incredibly tasty. The food at Din Tai Fung was exactly what my husband and I needed. It was filling, rich and delicious. Had we know this dumpling bar existed from the first day we were in Sydney, we may have come back to visit more than once.